If hard pack all terrain traction is what you desire then the MotoVator Tire by EFX is the right tire for you. Designed utilizing light truck engineering, this D.O.T. approved tire has a unique center tread pattern that provides a huge contact patch with the ground. This ensures the proper machine response when you put the pedal to the floor. EFX uses a proprietary rubber compound when manufacturing the MotoVator tire. This compound allows you to use and abuse the tire while reducing wear and tear to you and your machine. Built into the design of the MotoVator tire is the unique armor system that extends the tread down the sidewall to provide protection from the most harmful terrain. Reduced rolling resistance as well as low and high speed cornering is improved with the addition of the elongated shoulder tread. Additionally, the steel belted, 8 ply tire is designed to improve ride quality. 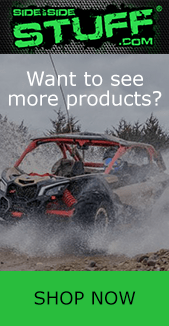 The MotoVator tire by EFX is a true radial, steel belted, puncture resistant tire that is designed to take the abuse that today’s UTV riders expect and is available in several different sizes and widths.